We have to know where are we heading. 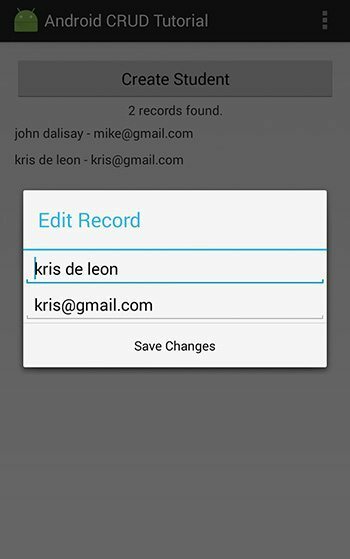 This will answer your question about how to create a record in Android SQLite database. Code should look like the following. 2.2.1 We will set up the OnClickListener of the “Create Student” button. 2.2.3 The following code will be placed inside the onCreate() method, under setContentView(R.layout.activity_main); code of your java/your.package.name/MainActivity.java file. 2.3.2 Remove the default code except the first line (your package code). 2.5.2 Get the application context, this is needed to inflate an XML layout file. Put the following code inside the onClick() method. 2.5.5 Try to run. The following image should be the output when you clicked the “Create Student” button. 2.6.1 Inside the AlertDialog’s “Add” onClick() method, we will save the record. 2.6.3 We’re actually using an OOP approach here. 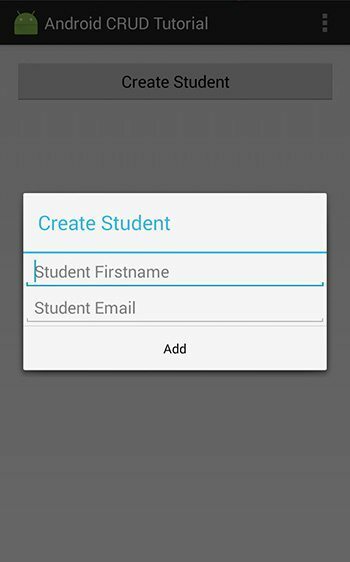 Create a new “ObjectStudent.java” file with properties “firstname” and “email”. Put the following code inside ObjectStudent.java file. 2.6.4 Going back to AlertDialog’s “Add” onClick() method, set the input values as a object, so we can save it to the database. 2.6.5 Create a new “DatabaseHandler.java” file. This file will handle all the SQLite database connection. It will have the following code. 2.6.6 Create new “TableControllerStudent.java” file, extending the DatabaseHandler. This file will control all the operations related to the student’s table. It will have the following code. 2.6.7 Do the create() method for creating new record. The following method is inside TableControllerStudent class. 2.6.8 Go back inside the AlertDialog of OnClickListenerCreateStudent.java file and call the create() method of TableControllerStudent class. 2.6.9 Tell the user whether insert was a success or failure. We will use Android Toast to do this task. 2.6.10 Try to run. You should be able to see a toast message and create a record. 3.1 On your res/layout/activity_main.xml, place a TextView under your “Create Student” button. 3.3 On your TableControllerStudent.java, create a count() method. 3.4 Go back to your MainActivity.java > countRecords() method and call the count() method you just created. 3.5 Display the count to the text view. 3.6 On your MainActivity.java > onCreate() method, call the countRecords() method. 3.7 On your OnClickListenerCreateStudent.java > inside AlertDialog, also call the countRecords() method. This will change the count value everytime a new record was created. 3.8 Try to run. Output should look like the following. 4.1 On your activity_main.xml, put a ScrollView with LinearLayout inside. Put the following code under the TextView textViewRecordCount. 4.2 On your TableControllerStudent.java, create a read() method. 4.3 On your MainActivity.java, create the readRecords() method. This will display database records to user interface. 4.5 On your OnClickListenerCreateStudent.java > inside AlertDialog, call the readRecords() method as well, so it will refresh the list every time we add new record. 4.6 Try to run. Output should look like the following. 5.1 Create new OnLongClickListenerStudentRecord.java file. We will use long click to give user an update option. 5.2 Set the OnLongClickListener for each of the display records. Go to your MainActivity.java > readRecords() method, inside the ‘for’ loop, put the following code under the textViewStudentItem.setTag(Integer.toString(id)); code. 5.4 Put the following code inside the onLongClick() method. 5.6 Try to run. Output should look like the following. 5.7 Inside the onClick() method of AlertDialog in section 5.5, put the following code. “Edit” has an item index of 0. 5.8 On your OnLongClickListenerStudentRecord.java, add the following editRecord() method. 5.9 Inside the editRecord() method, we will use the following code to read single record. Data will be used to fill up the student form for updating it. 5.10 On your TableControllerStudent.java, add the following method readSingleRecord() code. 5.11 Going back to OnLongClickListenerStudentRecord.java > editRecrod() method, inflate student_input_form.xml, this time we will use it for updating a record. 5.15 Inside the AlertDialog > onClick() method, create the object with the updated value. We are still in the editRecord() method. 5.17 On your TableControllerStudent.java, add the update() method. 5.19 Try to run. The output should look like the following. 6.1 Go to your OnLongClickListenerStudentRecord.java > onLongClick() method > inside the AlertDialog onClick() method. Put the following code after the first if statement. 6.2 Go back to your TableControllerStudent.java and add the following delete code. Let me know if you have any questions. If this Android CRUD Tutorial helps you, please like or share it to your friends! Thanks! 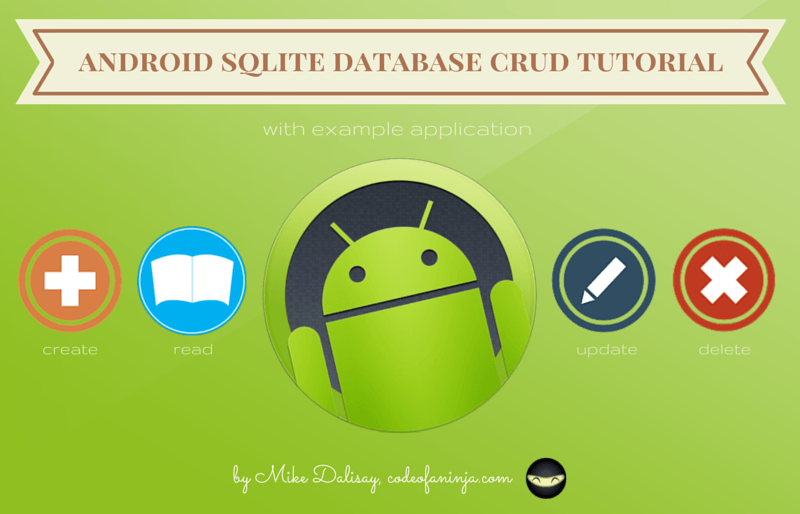 Today we have learned how to create, read, update and delete a record from Android SQLite database. If you found a problem with this code, we can solve it faster via Email or FB message, please send me a message via email mike@codeofaninja.com, or via our official Facebook page! Thank you! nice tutorial dude… its very helpful for me..
Wow, glad it helped you @8b4cc012196d1af940a93147766cd38c:disqus! Hi I would like to change the text color or the background color by click on the item. I guess Ishould do something with the public class TextViewLocationItemOnClickListener implements OnClickListener … onClick… change background… I was searching for solutions but I don’t find one… I don’t won’t to use list view and work with cursor… Is there anybody how can help me? Very interesting tutorial! But there is an error in the program. When you need to update an any item of the database (not the last one), after you click Edit you see not the correct values for edited item in the Edit form. The program picks values from the last created item but not from the item you need. I guess the error in LocationsTableController.java getLocation method. You move the cursor to the first db item, but the cursor must be moved to the db item selected by fieldLocationId. Thanks for pointing that out @79104e1d41701c0b29a1d7bce793dcfe:disqus! That’s certainly a bug, I forgot to include a WHERE clause to get the proper record. I updated the code a bit. Thanks again! Glad this was helpful to you @e68ff74f09e46deb53ef31d3bac15675:disqus! I have followed step by step so far and I am stuck here as I am not sure where to put this code. when I run the code on the “second run it” I got recordCount ZERO. Which means I am not writing to anything to the database as I am not getting a count of something I have entered into the database. This tutorial is awesome! Some mistakes or incomplete methods arguments but it’s ok. In fact, it’s better because I can understand what is happening. Thank you so much! Hello @risk_taker:disqus , do you mean the form validation? For example the user did not enter anything and clicked the save button? Hi, great tutorial. Do you have any idea how do i link the input data i have from the table to generate an XY chart using android’s aChartEngine? I’m using the first example. It’s very clear and really helpful, thanks for your great tutorial! Hello there @Bee, I’m glad our tutorial was clear enough and helpful to you! The archive accompanied with the article looks to be damaged. Cannot open it. Could you please re-download the complete source code. Hi @Veniamin, thanks for letting me know! It’s fixed now. Glad it helped you @disqus_Pyf9UX8c4Y:disqus! can I connect to sql server ? I’ve been trying to understand and use SQLite for so many months with nothing but confusion. This tutorial is by far the easiest to understand and I’ve even learned a few more OOP tricks in Java from how well put together this example it is. 好厉害! Thanks for your efforts, difficult to search for such good tutorials in China without Google. Hello and thank you for this tutorial! I have done everything as you mentioned in the descriptions but encountered a problem. The update functionality does not work. When i debug and check the contents, it always returns the id as -1. What do you think the problem is? Problem solved, I had a small mistake in my code. Glad you solved it @youssefechcherifelkettani:disqus, would you tell us what was your solution? Thanks man! so is update working for you now? I was following steps through 5.7 and the pop up is not popping up. Acutally, I thought I had clicked and held but I didn’t know I needed to hold longer until the pop up came up. Note: onlongclick means have to click and hold on text until item pops up, not just clicking on it and expecting it to pop up. Hello bee, thanks for reporting this, I’ll look into it and update the post above and send the fixes. Hi Mike your tutorial is really helpful, I am really grateful for this. OnLongClickListenerStudentRecord.java > onLongClick() method > inside the AlertDialog onClick() method. That way I can run the app successfully. You’re welcome @etheltadz17:disqus, glad to help! Just curious, what does SIS mean? Wow, thanks for the kind words and you’re welcome @etheltadz17:disqus! Glad to know our tutorial has been very helpful to you! Hi, thank you so much for this tutorials, everything work great except that I can’t get to edit and delete, which under Update a record in Android SQLite Database. After adding new record, we suppose to able to click the record to able to update and delete? Thanks. Hello @Lee, you’re welcome! About your question, you should be able to ‘long click’ a record so the ‘edit’ and ‘delete’ option will show. 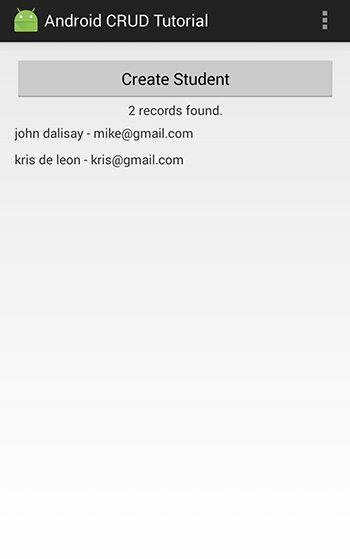 to display it i need to call readRecord at alertdialog only or also need to call in mainActivity? sir, how to add search fitur using your project?? Hello @disqus_c2C7V1qbWJ:disqus, we’ll add that feature in the future, thanks for sharing your thoughts. Hello, Where I need to put the count records inside the AlertDialog? Hello @ryanjaya:disqus , would you share your error or logcat messages? Thank you so much for this great tutorial! It helped a lot but I’m still stuck and get error (after trying everything and days after days) with: linearLayoutRecords.removeAllViews(); and linearLayoutRecords.addView(locationItem); in public void readRecords(). Could you please help me? Thanks again :) !! Hello @Patrick, you’re welcome! About your error, would you show us what your logcat message says? Hi there, I am doing a school project and I hope that you are able to help me asap:) Is there anything wrong with this code? Because I could not insert any values inside even though it shows a toast that says “Student information was saved”. Please help, thank you! Hello @disqus_0GwogDCNCy:disqus , how did you know the record was not inserted? If createSuccessful is true, record must be inserted. Please try to verify your ‘read’ code if it works properly. What do you mean by verify the read codes? Sorry im a noob in this! Hey thanks for the great tutorial, but the only problem was the delete method should take a parameter of type String as you declared id as a string in section 5.3. Apart from that it worked! Let me know if that works too! You’re welcome @pratamadarief:disqus ! Please share our site to one of your friends if you have time! 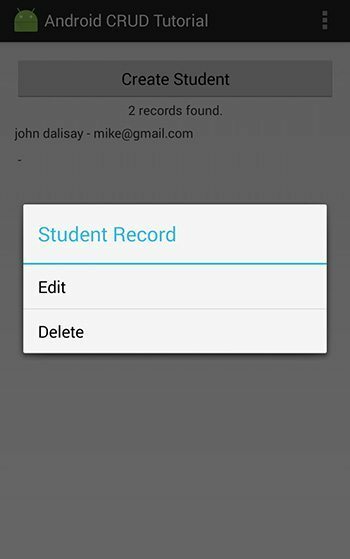 I have question, when recordcount = 1, buttonCreateStudent disable. Thank you very much. It’s very useful. I’m a php and c# developer. Now i wanted to learn android. i have tried in many CRUD from many other pages. But it has not work or i had not understand. But this was page is very help full to me. I’m not very well in english, but have understand this CRUD thanks a lot. Thanks for the kind words and you’re welcome @disqus_bSuAwY1xlG:disqus, please share our site to one of your friends if you have time, thank you! it looks absolutely brilliant. A suggestion: Can you also make some with retrofit ? If I remove them, the app does not fail when the “Add” button is clicked and therefore the TextView’s are not refreshed. What could be the problem dudes?? Thank you for sharing your solution. I updated the post. Still having the same issue, Any resolution? i’m having same issue…any luck finding a solution?? Hi @Emily, Glad your were able to complete our tutorial! Good luck with your apps! nice blog. excellent post. in this blog stor information of student. in this update, delete,edit perform this opration. Hi @mayuri, thanks for the kind words! Wow, such a great tutorial…thank you so much. your code is clearly understandable without creating any mess. Gostei de mais VLW Ninja!